Chancel Choir rehearses in the chapel each Thursday from 7:00-8:30 p.m. September- June and on Sundays prior to worship. No prior music experience is necessary to join! Handbell Choir rehearses on Thursdays from 5:30-6:30 in laughter-filled sessions. 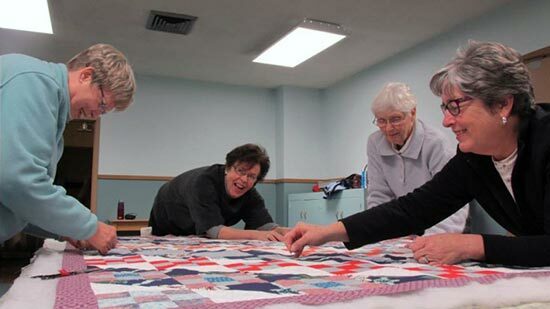 Martha Service gathers at the church at 9:30 a.m. on the first Wednesday of the month to tie quilts and prepare baby items for local mission. Men’s Breakfast provides an opportunity for friendly fellowship on the first Saturday of each month at 8:30 a.m. in the fellowship hall. Tables for Eight are dinner gatherings held in church members’ homes. Participants rotate among different groupings to get to know other community members. Groups are available for adults and for families. Reading in the Afternoon book group meets at the church at 1 p.m. on the 3rd Wednesday of the month to discuss the month’s selected book. Sarah Circle is a women’s Bible study that gathers at the church at 7 p.m. on the second Tuesday of the month September through June. Mariners are social and service groups that usually meet in one another’s homes. Singles and couples are enthusiastically invited to join. Activities for Youth are held throughout the school year on Sundays following worship, as well as at other times. Contemplative Spirituality meets each Tuesday from 10-11 a.m. for prayer, reflection, and listening for God in the lectionary. Gentle Moves movement class meets each Thursday from 10-11 a.m.
For information about any of these groups, please contact the church office.